Kevin Johns tells of his surprise and delight at receiving the award at this year’s End of Season Dinner. I can’t tell you how honoured and surprised I was to receive The Lifetime Achievement Award at The Annual Swansea City Awards Dinner. I would like to thank everybody at The Swansea City Supporters Trust who sponsor and choose the recipient of this award and pledge my continued support to them for the amazing job they do backing the Swans! The Swans are my football team because they are my local team! I love football fans who support their local team! Wherever you live your local team should be your team! I first watched the Swans in 1968 when I went to an end of season friendly against Newport County with my dad and Jack Williams, our next door neighbour in Essex Terrace Plasmarl. We stood on the North Bank and I loved it. My dad and I got Season Tickets for the new season in the Double Decker and every game I followed heroes like Tony Millington, Vic Gommersall, Brian Evans, Dai Gwyther, Jeff Thomas, Herbie Williams, Mel Nurse and Lennie Allchurch! 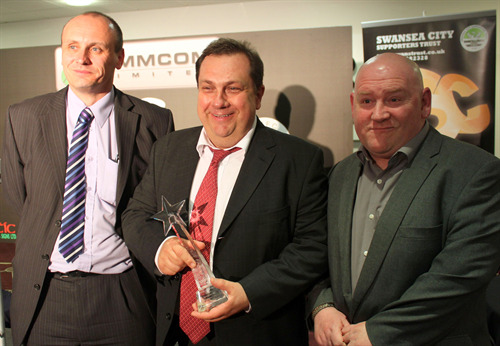 For me to walk out of a Swansea City Awards night with an award was a totally unexpected. I had no idea and I was compering the evening! The realisation came as Supporters Trust Chairman Phil Sumbler ( pictured (left) with Kev and Supporter Director Huw Cooze (right)) said this year’s winner was born on April 15th 1961 – I though thats me – apparently my thought was quite loud! Thankyou to everyone who was involved in this decision and to everyone for kind comments on the night and in the days since.